No Fenders -Formula 1, IndyCar and A Whole lot more..: If Bo Knows Indy Cars, then Where Did Chase go? As I find it interesting how Alabama has an affinity for having a diverse selection of Grand Marshal’s for its annual IndyCar race, as this year’s selection Bo Jackson was infinitely better then last year’s overly long winded Bart Starr; CUT! I SAID CUT GAWD DAMN IT! GO TO COMMERCIAL... WTF? He’s still talking? Oh Never Mind! And thus, by my very unscientific count, there have only been four Black American racecar drivers to ever race at Mother Speedway over her 104year history, with this startling lack of competitors being almost infinitesimal! Although the casual racing fan would be quick to point out that “Louise ‘JAGUAR” Hamilton is the first black F1 driver, that honour actually belongs to William Theodore Ribbs instead, who beat the young Lewis to the punch by some two-plus decades when he took a spin aboard one of Bernie Ecclestone’s Brabham-BMW’s ‘Wayback in 1986, albeit only for testing purposes, as Ribbs wasn’t offered the ride by Uncle Bernaughty. Willy has always been a brash figure, who’s early machismoism reportedly got him into being black listed by team owners, having been put on suspension for once punching an opponent. Yet Ribbs has also been given some breaks by the likes of Jim Trueman, the Ford Motor Company and Dan gurney to name a few - with Bill Cosby becoming his IndyCar benefactor before moving onto an abortive IRL audition, a less than stellar NASCAR renaissance along with a season in PickemUp Trucks before ultimately retiring from motorsports, albeit making a brief comeback upon a One-off Indy Lights appearance at Baltimore aboard his own team’s No. 75 entry which was created primarily to run his protégé Chase Austin. What more can I say about the young “Louise ‘JAGUAR” Hamilton that hasn’t already been said. As the Ron Dennis prodigy, who ultimately delivered the ‘Ronster’s final World Championship to date, has made what appears to be a somewhat brilliant move to Mercedes this year as his Woking based competitors continue floundering. Hamilton’s rise to the top was meteoric to say the least, having caught his racing bug by winning an RC championship as a ‘wee lad, before winning multiple Karting titles en route to progressing to single seaters, where Lewis won more titles in Formula Renault, F3 Euroseries and ultimately the GP2 crown in his debutant 2006 season. Hamilton burst onto the F1 scene in ’07 much to the chagrin of teammate and reigning Double World Champion Fernando Alonso, who he effectively blew into the weeds! As Hamilton completed his North American “Double” by claiming the first two victories of his Formula 1 career by “Breaking his Duck” in Canada prior to dominating the ’07 USGP at Indianapolis, sadly its final race. Its too bad that Chase Austin has never gotten a proper chance to prove himself in either Stock Car or Open Wheel Racing, as the Kansas native seemingly is another prodigy waiting to be tapped - having won some 60-odd Go Karting events in his youth, and a total of 100-plus “W’s” in Karts, Sprints and Stock Cars. And shame on Rick Hendrix, who after signing the 14-year old Austin to a driver developmental contract and running him in ASA competition, pulled the plug upon the program the following year. And ditto for Rusty Wallace who also signed the young talent to run him in the Busch series before also shutting down its program for Austin, who saw limited action between 2007-10 in both the NASCAR Busch and Craftsman Trucks series before finding himself out of a ride permanently. Thus in 2011 in regards to his mentor’s twentieth anniversary of making the B-I-G RACE at Indianapolis, Chase was tapped to drive the No. 75 Willy T. Ribbs/Brooks Associates Indy Lights entry in that year’s Freedom 100, as the entry was co-managed by Chris Miles, Ribbs and Michael Brooks with financial backing largely from American Honda. Austin started second from last in P17 and ultimately finished ninth in his Indy Lights debut - with that year’s winner being Joseph Newgarden en route to the series title. For the 2012 Freedom 100 Austin ran for Juncos Racing, starting 16th and finishing 10th, before having his glitzy press conference alongside A.J. 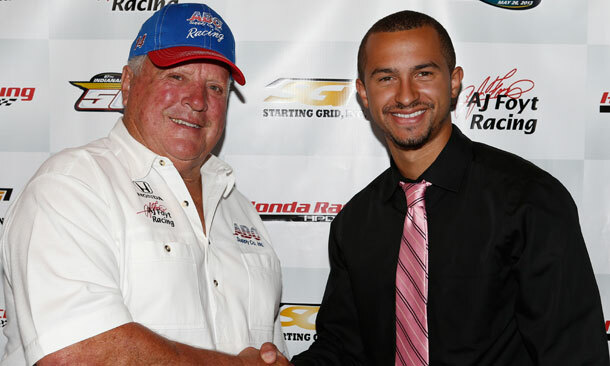 foyt in August to announce that he’d be graduating to the B-I-G CARZ for the 2013 Indy 500 as part of Honda’s continued Diversity campaign. Yet as we all know, Chirp-Chirp, has anybody seen Chase? The deal went horribly sour as speculation suggests that Chris Miles failed to deliver the necessary funding for the project, albeit I’d swear I heard Conor Daly claiming it was nice to be getting paid for once - instead of needing to bring the requisite funding for his IndyCar debut at the Speedway. Which if true, seems a bit odd that the Austin deal didn’t come to fruition - or was this just simply a convenient way to dump the lesser known Austin in favour of the more talented Daly? As obviously we’ll never know, although I still say it seems odd that Honda didn’t help see I-T through. Yet perhaps in hindsight, this is the best move possible for black racing drivers at Indianapolis - since where would it have led to if Austin had less than a stellar outing? And even then this was simply a “One-off” race as apparently NO IndyCar, nor Indy Lights team owners for the matter have exactly been knocking on Austin’s door recently, eh? As Bryan Herta Autosports dusted off one of its old Indy Lights chassis in order to insert Chase into the No. 28 for the Freedom 100 - where Austin qualified ninth and finished eighth in a field comprising of a paltry eleven entries... As Chase ran a solo race virtually all day at the back, albeit it was his first time in a Lights car since last year’s Freedom 100 and I don’t think he’s exactly gotten a ton of seat time lately!